Man, it is times like these that I really love this site. Graeme sends this note with his picture. Thanks man. Here is to you! It’s pretty self-explanatory once you see the pictures. The story behind it though – teased a lot as a kid for obvious reasons. I’m taking back the word and using it as a reminder of all the things I’ve overcome. Throughout life, I have always dealt with tough situations using humor. When I was diagnosed with kidney failure years ago, the doctor told me how it would go down. I have always thought the word gimp was kinda funny, and then I sort of was one. I got the “GIMP GRIP” knuckles with the handicap symbol for the “G” because I knew as my condition got worse, to me, the tattoo would keep getting funnier and would always be appropriate. The blue was color-matched to the blue in the handicap parking sign. The knuckles were done by TROLL at The Salty Dog Tattoo Shoppe in Fort Worth, TX. 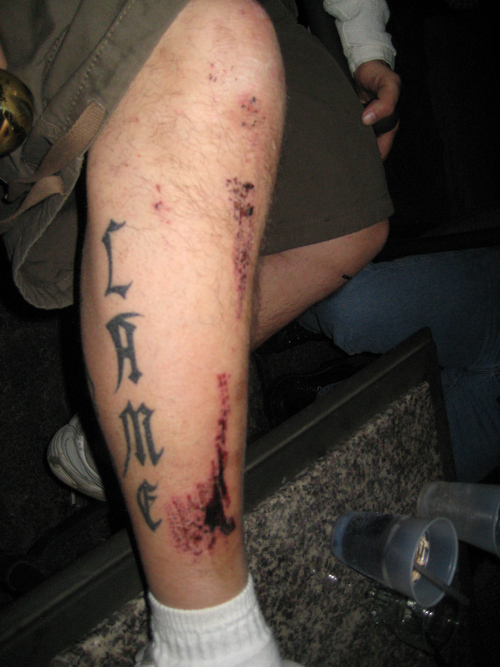 The “LAME” leg was done by Bear at the same shop.